A major problem with the invoice process shown in the previous post is that the materials were ordered by Email without a formal process behind. If the manager does not approve the vendor invoice and the purchase of the goods or services, it is often too late to stop or revoke the delivery and the whole purchase. To avoid such unpleasant situations, the approval steps can already be executed before the goods or services are ordered from the vendor. The Dynamics AX/365 for Operations instrument that supports those early approvals are purchase requisitions, which allow users specifying what they require before things are ordered from vendors. The next screen print summarizes the different steps and responsible persons involved in the example that will be illustrated in the following. The sample process starts with the preparation of the purchase requisition by Nicole Holiday. Thereafter, a group of purchasing agents has been defined that is responsible for reviewing the purchase requisition to ensure that the requisitions are complete and do not include errors. The next process step consists of an approval of the manager of the cost center for which the materials are ordered. Once the cost center manager approved the requisition, the goods can be ordered through the creation of a purchase order. To ensure that the goods or services arrived, a formal receipt process step has been built in. The process finally ends with the recording of the vendor invoice. Because of the early approvals and provided that there is no difference between the price and quantity ordered and invoiced, the vendor invoice can automatically be posted. If, on the other hand side, a price or quantity variance exists, an additional approval from the cost center manager is required. Please note that the process steps illustrated above are supported by two different workflows, which can be identified from the next illustration. The next subchapter details the setups required for the implementation of the sample process steps / workflows. Thereafter, the whole process will be illustrated based on an example. Due to the number of steps and setups involved, only the first three steps of the sample process will be included in this post and the remaining steps will be explained in the next one. The first process/workflow step starts with the creation of a purchase requisition. As the purchase requisition is created manually, no specific setup is required. As mentioned above, the second process step consists of a review of the purchase requisition by a group of purchasing employees. 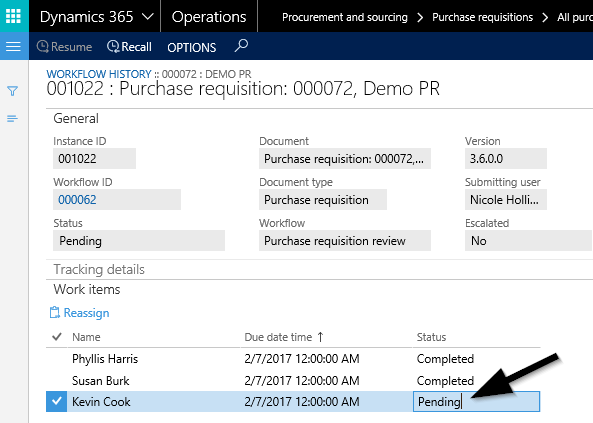 This process step is incorporated in Dynamics AX/365 for Operations through the purchase requisition workflow illustrated in the next screen print. 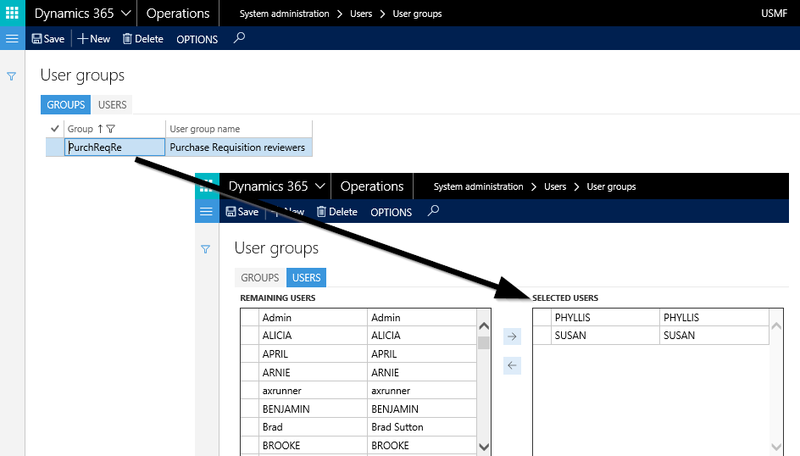 The first workflow step (‘Review purchase requisition’) is thereby implemented through the selection of a ‘participant’ assignment type that is linked to a specific user group. For details, please see the next screen print. For the sake of this example, Phyllis and Susan have been promoted to purchasing employees and connected to the user group that is responsible for reviewing the purchase requisitions. The third process/workflow step requires the cost center managers to approve the purchase requisition. This workflow step is assigned to the purchase expenditure reviewer group ‘AppREQ’. 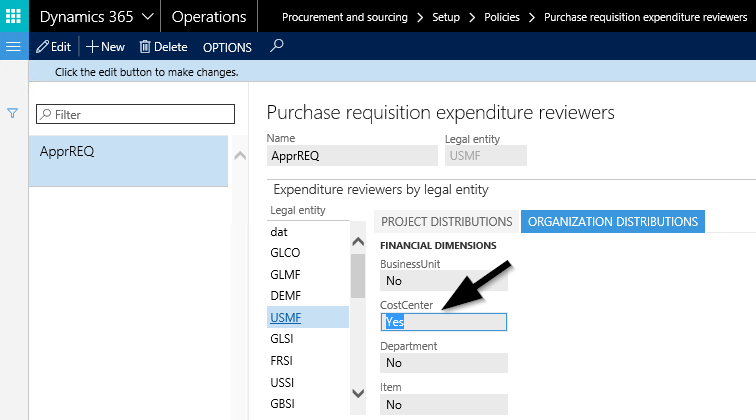 Please note that this reviewer group refers to the cost center owners (managers) and consequently requires that a cost center financial dimension is specified with the purchase requisition. 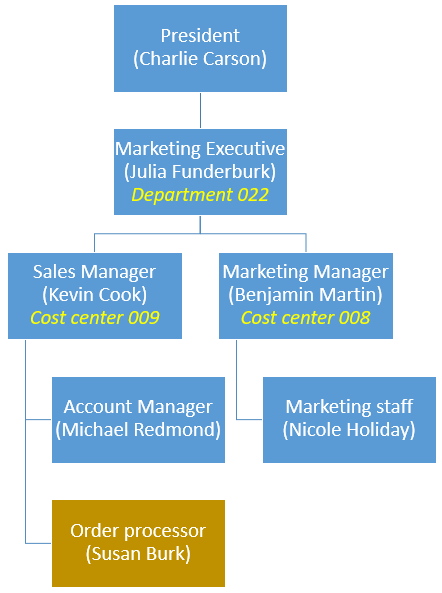 Based on the previously setup workflow steps and the following organizational chart, Nicole Holiday prepares a purchase requisition for a software training on behalf of her colleague Susan Burk. 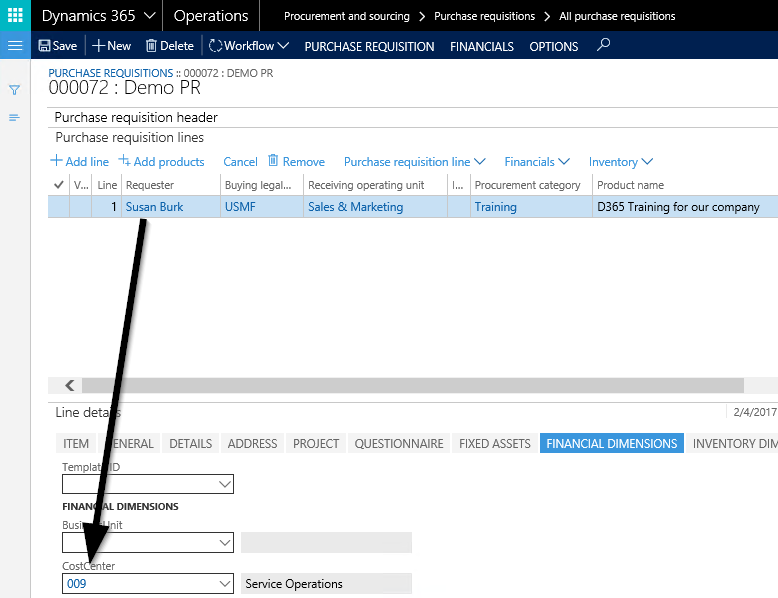 Because Susan’s employee record is linked to the cost center she works for, the required cost center information is automatically transferred to the purchase requisition. Please note that this transfer is important for the subsequent identification of the approver of the purchase requisition. This is exemplified in the next screen print. 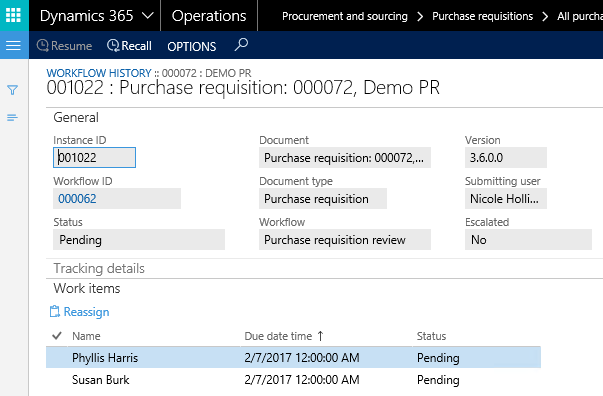 After submitting the purchase requisition, the first review task is assigned to all users that are included in the purchase requisition reviewer group. … she has to review the requisition and verify that all necessary information have been provided. Once the review step is completed, the next workflow step is assigned to Kevin Cook, the cost center manager of Susan. Please note that the cost center that is assigned to the requester and not to the one of the preparer of the purchase requisition determines the cost center manager that is responsible for approving the purchase requisition. … its status changes to approved, which ends the purchase requisition workflow and allows the creation of a purchase order. This workflow step concludes this post. The remaining workflow steps are illustrated in the next post. Till then.